The Signature Series’ newest model is sure to become a customer favorite! If you’re in the market for a lift chair that won’t take up much space, the new Savannah PR930 is the chair for you! 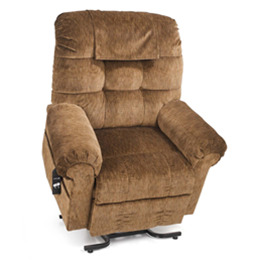 Golden has added another “wall hugger” model to our line with the new Savannah lift chair. Featuring a classic button back style that will match any décor, it requires only 2” from the wall for a full recline. The Savannah joins the Winston, Royal, Space Saver and Regal in the Golden Signature Series family. Golden Technologies takes all the worry out of purchasing a lift chair. Our expert craftsmen blend the finest components with superior designs to provide you with the utmost quality, comfort and style. We confidently stand behind all our products and provide you with the best warranties in the industry. Choose the lift chair that all others are measured against…choose Golden! We invite you to sink into the plush, overstuffed backrest of Golden's newest lift chair, the Winston. This oversized model will wrap you in luxurious comfort like your favorite blanket. Featuring an overstuffed, biscuit-style back and plush, rounded armrests, the Winston offers generous proportions for roomy relaxation. A three-position lift chair with a 375 lb. weight capacity, the Winston requires only 19 inches of space from the wall for a full recline.